480.635.8114 Free Phone Quotes! We Can Fix Anything! That is honest? Has integrity? And offers a great value? The city of Avondale is now accepting applications from nonprofit organizations looking for grants to aid projects and activities related to health and human services. Through the city’s contributions assistance program, nonprofit agencies that improve residents’ quality of life can earn direct monetary grants. Applications are due by 5 p.m. Thursday, May 9. The city has set forth a number of criteria. preference for services provided in Avondale. • Applicants who received previous funding must be current in their reporting. 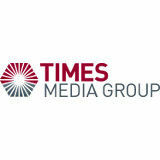 Timely and accurate reporting will be taken into consideration. • Applicants must demonstrate the ability to generate revenue from other sources. • The maximum amount of an award will not exceed $10,000. Applications are available at https:// bit.ly/2VDS759. For more information, contact Sheryl Steele at 623-333-2717 or ssteele@ avondaleaz.gov. For questions or assistance with the online application, contact Paula Swenson at 623-3332720 or pswenson@avondaleaz.gov. The American Red Cross encourages eligible donors in the West Valley to give blood or platelets during National Volunteer Month this April. Eligible donors of all blood types – especially type O – are needed to help ensure blood products are available for patients this spring. Nearly half of the public knows someone who has been helped by a blood transfusion. Volunteer donors are the only source of blood products for those in need of transfusions, and the Red Cross salutes the volunteer blood and platelet donors who help fulfill its lifesaving mission. While donors of all blood types are needed, the Red Cross currently has a severe shortage of type O blood donations and urges type O donors to give now. automatically entered for a chance to win a full-size Iron Throne from HBO’s “Game of Thrones.” Terms and conditions apply and are available at redcrossblood.org/hbogameofthrones. Additionally, all presenting donors from April 11 through 30 will receive a commemorative “Bleed for the Throne” poster, while supplies last, and automatically be entered in the above-mentioned sweepstakes. A blood donor card or driver’s license or two other forms of identification are required at check-in. Individuals who are 17 years of age in most states (16 with parental consent where allowed by state law), weigh at least 110 pounds and are in generally good health may be eligible to donate blood. High school students and other donors 18 years of age and younger also have to meet certain height and weight requirements. Make an appointment to help save lives now by downloading the free Red Cross Blood Donor App, visiting redcrossblood.org or calling 1-800-RED CROSS (1-800-733-2767). Blood and platelet donors can save time at their next donation by using RapidPass to complete their pre-donation reading and health history questionnaire online, on the day of their donation, before arriving at the blood drive. To get started, follow the instructions at redcrossblood.org/rapidpass or use the Blood Donor App. A/C INSPECTION Get tuned up for the cooling season! Call for details. Some exclusions apply. Expires 4/30/19. (Regularly $150) Call for details. Must mention coupon. Some exclusions apply. Expires 4/30/19. CALL TODAY! 1-844-201-2758 *With a single battery. © 2019 Inogen, Inc. All rights reserved. would not assist her, that she said she first faced gender discrimination. Marilynn Smith, founder of the LaBut it was that discrimination, Smith dies Professional Golf Association once said, which led her to create the (LPGA), died aged 89 in Goodyear on Marilynn Smith LPGA Charity ProApril 9. Am, through which she Smith, who founded the could raise funds for female Association in 1950, won golfers who wanted to at21 tournaments in the early tend college. years of the women’s pro“That’s what inspired me fessional tour and is also recto start this event to allow ognized for having created $5,000 grants to 30 young the Marilynn Smith LPGA women at year,” Smith Charity Professional-Amonce said in an interview. ateur event, which raises Born in Topeka, Kansas, money to assist female golfon April 29, 1929, Smith ers with college expenses. grew up in Wichita, where “Marilynn was my foundher father worked in life er, my North Star and, most Marilynn Smith died in insurance. Though both of age 89. (Photo importantly, my friend,” Goodyear, her parents, Lynn and Alma courtesy LPGA) LPGA Commissioner Mike Smith, played golf, she at Whan said. “In her life, she broke bar- first didn’t intend to play the sport. riers, shattered stereotypes and made “I thought golf was a sissy sport,” she others ‘believe.’ I’ll miss her weekly once said. “I ran a boys baseball team handwritten cards, her daily calls to my and was the pitcher and manager. One office, and her love for every LPGA day I came home and my mother asked teacher, tour player and staff member. how I’d done. I used a four-letter word Quite simply, Marilynn left this world and she washed out my mouth with better than she found it – and set a stan- Lifebuoy soap. Mom told my dad, who dard that will guide us forever.” suggested taking me to Wichita Country Smith became a pro in 1949 and Club for the more ladylike sport of golf.” signed a $5,000 contract with SpaldSmith began playing golf when she ing for 50 to 100 clinics annually. She was 11. She won the Kansas State Ameventually earned her own signature ateur three consecutive times and was line of clubs. called “The Blonde Bomber” because She won the first of her 21 LPGA she blasted the ball 25 yards longer than victories at the 1954 Fort Wayne Open any other female player at that time. and the last at the 1972 Pabst Ladies Although a fierce competitor on the Classic. Her victories also include two course, she was a stronger advocate for major championships: the 1963 and equal treatment for women, which most 1964 Titleholders. say is how she will be remembered. Smith co-founded LPGA, the oldest “(Smith) has always been a giver,” women’s professional sports organi- Spork said. “She worked so diligently zation in the world, with Alice Bauer, as president of the LPGA, out selling Patty Berg, Bettye Danoff, Helen Dett- the tour to sponsors. When we travweiler, Marlene Bauer Hagge, Helen eled, we drove, and we’d pull into a Hicks, Opal Hill, Betty Jameson, Sally gas station and she would start chatSessions, Shirley Spork, Louise Suggs ting up a young person. There she endand Babe Zaharias. ed up giving away more money that Smith was its president from 1958 to we paid for our own gas.” 1960, and in 1973 she became the first Smith received the first Patty Berg woman to work a men’s event, when Award for distinguished service to she served as a television broadcaster. women’s golf in 1979. Earlier on in life, Smith attended the She was inducted into the World University of Kansas, where she won Golf Hall of Fame in 2006. the 1949 national individual intercolOver the past few years, she continlegiate championship. Previously she ued to sponsor a tournament to raise had captured the Kansas State Ama- scholarship money for female high teur title from 1946-48. school seniors planning to play golf Because Kansas did not have a wom- in college. She continued playing golf an’s golf team, Smith sought funding recreationally until she was about 70, in an effort to play in the 1949 cham- when she hurt her knee and was forced pionship. It was then, when the school from the course. be delivered in the community versus having people travel for those services,” he explained. Annette Bourne, regional director of the FTF Southwest Maricopa Region, said each of the agencies contributes to the center in its own unique way. or even planned out the work that happens at this family resource center,” she said. Cummings said the same partnerships will remain with Care1st Health Plan Arizona at its new facility – slated to be under construction in 2020. Named in honor of former President Theodore Roosevelt, the carrier is longer than three football fields, measuring nearly 1,100 feet. The ship, a true floating city, weighs more than 100,000 tons and has a flight deck that is 252 feet wide. Powerful catapults slingshot the aircraft off the bow of the ship. The planes land aboard the carrier by snagging a steel cable with an arresting hook that protrudes from the rear of the aircraft. A key element of the Navy the nation needs is tied to the fact that America is a maritime nation, ac- Petty Officer 3rd Class Timothy Howar is a 2011 High School graduate. (Photo courtesy cording to Navy officials, and that Millennium Mass Communication Specialist 3rd Class Jason Meyer) the nation’s prosperity is tied to the ability to operate freely on the world’s and women make up the ship’s crew, oceans. More than 70% of the earth’s which keeps all parts of the aircraft carsurface is covered by water, 80% of rier running smoothly – this includes the world’s population lives close to a everything from washing dishes and coast, and 90% of all global trade by preparing meals to handling weaponry volume travels by sea. and maintaining the nuclear reactors. Being stationed in San Diego, the Another 2,500 men and women form principal homeport of the Pacific Fleet, the air wing responsible for flying and means Howar is playing an important maintaining the aircraft aboard the ship. part in America’s focus on rebuilding “Naval aviation is the ultimate team military readiness, strengthening alli- sport, and a nuclear-powered aircraft ances and reforming business practic- carrier cannot accomplish her mission es in support of the National Defense without the professionalism and experStrategy. tise of every sailor aboard,” said Capt. “Our priorities center on people, ca- Carlos Sardiello, Theodore Roosevelt pabilities and processes, and will be commanding officer. “The crew of achieved by our focus on speed, val- Theodore Roosevelt has proven themue, results and partnerships,” Secretary selves time and time again, and their of the Navy Richard V. Spencer said. level of professionalism and dedication “Readiness, lethality and moderniza- is second to none.” tion are the requirements driving these Theodore Roosevelt, like each of the priorities.” Navy’s aircraft carriers, is designed The Pacific is home to more than for a 50-year service life. When the 50% of the world’s population, many air wing is embarked, the ship carries of the world’s largest and smallest more than 70 attack jets, helicopters economies, several of the world’s larg- and other aircraft, all of which take off est militaries, and many U.S. allies. from and land aboard the carrier at sea. The Navy has been pivotal in helping All of this makes the Theodore Roomaintain peace and stability in the Pa- sevelt a self-contained mobile airport cific region for decades. and strike platform, and often the first Though there are many ways for response to a global crisis because of sailors to earn distinction in their com- a carrier’s ability to operate freely in mand, community and career, Howar international waters anywhere on the is most proud of earning a meritorious world’s oceans. advancement for his achievements in As a member of one of the U.S. Na“A” school. vy’s most relied upon assets, Howar “Stepping into a new career field, es- and other Theodore Roosevelt sailors pecially one as complex as maintaining know they are part of a legacy that will records for aeronautical equipment, I last beyond their lifetimes providing had no idea what I was getting into,” the Navy the nation needs. Howar said. “It took all of my drive “You get the opportunity to experiand hard work to accomplish that ad- ence things through the Navy that you vancement.” just don’t get anywhere else, and it reSailors’ jobs are highly varied aboard ally does make you a better person,” the carrier. Approximately 3,200 men Howar added. PA Lambert graduated from Christian Brothers University with a bachelor’s degree in Natural Science. She obtained her master degree in Physician Assistant Studies from Christian Brothers as well. She is board certified and is a member of the American Academy of Physician Assistants and the Association of Physician Assistants in Obstetrics and Gynecology. Her interests include adolescent gynecology and general obstetrics. West Valley Women’s Care provides compassionate, comprehensive advanced Obstetric & Gynecologic care to patients in the West Valley and Phoenix metropolitan area. Must be 18 years old, or 13 with parent/guardian. Home club only. Billed monthly to a checking account. Commitment and state and local taxes may apply. Subject to a low one time startup fee. Subject to $39 annual fee. Planet Fitness locations are independently owned and operated. © 2019 PFIP, LLC. ers delivering high-energy, fast-paced information for the liveliest summit to date. The presenters are experts in their profession or industry, and include innovators, strategists, college educators and leaders. Attendees will gain practical skills, learn the newest tactics and methods, and make valuable connections to help their businesses grow. A list of topics and other information for the Southwest Valley Small Business Summit is available online at southwestvalleychamber.org. Registration – $25 – includes entry to the summit, breakfast, refreshments and summit materials. Seating is limited. Sponsorship packages are available for broadminded businesses and entrepreneurs. formation, find it on Facebook @snapfitnessbuckeye. That’s all the briefs for this week. Thanks for reading! Have an item for Business Briefcase? Email Connor Dziawura at cdziawura@timespublications.com. ter, Gonzalez will also earn a trip to Turkey, where he’ll train and compete there. “My favorite part about competing is to show how good I am,” Gonzalez said. Gonzalez just returned from a tournament in San Diego. He competed in Mexico prior to that, according to his mother. He currently trains with coach Jerry Laurita at the Sentosa Martial Arts gym in Avondale. From Monday through Eddie Gonzalez is just 12 years old, but his Muay Thai skills have allowed him to travel the world and compete. (Photo Friday, Gonzalez is in courtesy Krystal Grado) the gym polishing his craft, spanning several ting the bottom half of his right kidney. hours per night, his mother said. Right now, he only has a kidney and a There were reservations from his half.” mother about letting a young, 10-yearHis mother acknowledges that, yes, old boy join a sport as rigorous and her son has taken a great deal of body physically-demanding as Muay Thai. shots – a la kicks and jabs – and cer“When I was pregnant with Eddie, tainly more are on their way. While she doctors had to induce me because he was initially nervous about the notion was sick from his kidney,” Grado said. of him taking shots to his kidney area, “He had a double ureter, the little tube she said Gonzalez has done an excepthat goes down to the bladder from the tional job of “protecting himself.” kidney. He had one that would come “We haven’t had any problems,” she back up to the kidney and it was rot- said. Gonzalez is aware of the successes that have mounted before him since joining Muay Thai competition two years ago. Now, he’s got an eye on the bigger picture, which just so happens to be another big goal on his agenda. “I want to fight in the Olympics,” he GENERAL & COSMETIC DENTISTRY said. FOR ADULTS & CHILDREN That becomes a possibility at 15 years of age, he said. For now, as New Patient Special • Digital X-Rays = low radiation Gonzalez carefully eyes that Olympic Adults Children • Advanced sterilization techniques appearance from afar, he’ll focus on • Affordable and gentle dental care for your entire family sharpening his skills and traveling the • Most insurance plans accepted world while doing so. • No interest payment plans Includes Exam, Full Set Non-Insured, Senior, Military Discount. All while just 12 years old. of X-Rays & Cleaning Call for Details! While in Thailand, Eddie will also USC Graduate with 18 years of experience make tennis shoes for less fortunate Celebrating Our 13th Year Anniversary children in need of new shoes. Call NOW for appointment For those interested in providing FREE OPEN 2nd the family with the funds for this trip, Opinion (623) 535-8777 Saturdays Se Habla Español donations are accepted at gofundme. com/help-eddie-become-a-muay-thai14551 W. Indian School Rd #200 • Goodyear, AZ Southeast Corner of Indian School & Bullard champion. New patients only. Restrictions apply. Cannot be combined with any other offers. Cleanings available only in absence of gum disease. staff. I really want to invite the community out to be a part of what’s going on because you need that community support.” It’s Dourisseau’s program now, and he’s thrilled to put his own spin on it. Aside from welcoming the community with open arms, he also wants to put Fighting Lobos football on the map as a “powerhouse” in the West Valley. In years past, when the Fighting Lobos have struggled to win games, football players who should be attending La Joya are electing to take their talents elsewhere. Instead, they attend neighboring high school with better football programs. The new Fighting Lobos skipper wants to put an end to that immediately. Head coach Devin Dourisseau has high hopes for his “I want to change the percep- first season as head coach of the Fighting Lobos, reaching the postseason for the first time tion of La Joya football. I want including since 2008. (Photo courtesy Joseph Ortiz) us to be a powerhouse school. I want to take us to the next level. I want to a playoff appearance. A 7-3 record was be the Millennium, the Desert Edge, the not impressive enough, Dourisseau Centennial of the West. I think we can do was told by the Arizona Interscholastic that, and it starts at the top with me. Association, because it lacked any sig“I want kids to want to come to La nature wins. Joya.” This year, to avoid missing the postAmong a list of “20 applicants” for season for the eleventh consecutive the school’s head coaching vacancy, season, the Fighting Lobos have three Dourisseau has a hunch as to why he games circled on their schedule: Marwas the last man standing. He’s a part quee matchups against Chaparral, Baof the La Joya community already – as sha and Westview. a science teacher at school and also livWinning two of three of those games ing in the neighborhood. will almost certainly lock up a playoff His children went to La Joya, his son berth, given La Joya is able to cross its Ts played quarterback years ago for the and dot its Is elsewhere on the schedule. Fighting Lobos and, frankly, he’s been “I’m the face of this organization here for this long already that he’s seen that I’ve already been a part of, and I a majority of his current student ath- take that seriously. When your name is letes grow up. attached to something, you definitely “Anybody can talk about Xs and Os, want to make sure that you have your but I think it’s how my ability to relate best foot forward and you take care of to the kids and be a part of the commu- all the business,” he said. nity and the kids being able to relate to In an effort to get the community me and know what I’m all about.” invested in what the Fighting Lobos The groundwork of flipping the cul- are building, Dourisseau is putting on ture of La Joya football on its head a Future Lobos Youth Football Camp must start in spring camp. Dourisseau on April 23 through April 26, aimed at and the Fighting Lobos will open up getting children involved in the sport. their spring football schedule from The community is also invited to parApril 29 through May 10. ticipate in the program’s meet and greet They’ll also begin summer workouts on April 27, where the new coaching the first week of June, and in the mid- staff and administration will be on full dle of the month they’ll travel to San display explaining upcoming communiDiego State University to participate in ty service activities, information about seven-on-seven competitions. the Lobo’s Booster Club and more. The Fighting Lobos’ official first day For more information about both of practice is set for July 29. events, contact Dourisseau at devin. Last season, La Joya was robbed of dourisseau@tuhsd.org. team identity. The goal is to build chemistry and skill to compete for state titles, just like the indoor team did this season. But, they are stopping to appreciate every moment along the way. vice on developing and pricing products and services at 6:30 p.m. at the Buckeye Coyote Branch Library, 21699 W. Yuma Road. For information, call 623-349-6354. 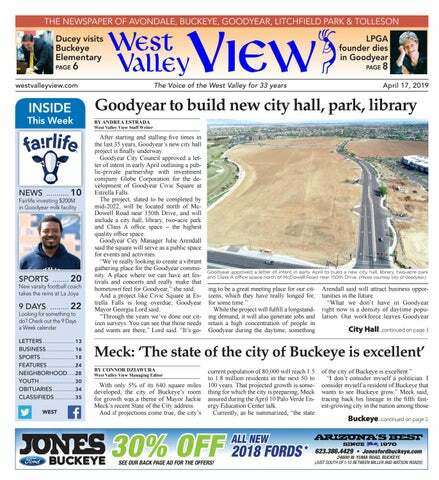 WEST VALLEY VIEW NEWS | APRIL 17, 2019 tures, alignment and breathing on sing songs and take part in activiMondays from 6:30 to 7:30 p.m. at ties at 11 a.m. For information, call the Buckeye Sundance Park, 22865 623-936-2746. W. Lower Buckeye Road. For inforDisciple Outreach mation, call 623-349-6350. The Avondale Police Department is bringing attention to the Special Olympics with its annual Torch Run from 11:30 a.m. to 1:30 p.m. Thursday, May 2. The fundraiser, a 3.17-mile run, starts at Litchfield Road and Van Buren Street, proceeds east on Van Buren Street to Avondale Boulevard, and ends at the Avondale Civic Center Complex. More than 80 participants comprised of officers from Avondale, Luke Air Force Base and the Arizona Department of Corrections will run and carry the torch throughout the designated route. The Avondale event is part of the Law Enforcement Torch Run campaign to benefit the Special Olympics, which began in 1981 in Wichita, Kansas. The national effort of the Torch Run campaign is the largest grassroots fundraising movement for the Special Olympics. Last year, Avondale raised $16,412 for the Special Olympics. The Avondale Police Department supports Special Olympics, and encourages its officers to be involved in these events as it unifies the department in an effort to raise funds and awareness for the organization locally. The public is encouraged to cheer and support the event, or to join the celebration at the end of the route, at the Avondale Civic Center outdoor amphitheater. The Torch Run will start at noon. The celebration at the Civic Center will commence shortly after the torch arrives to the complex. The Avondale Civic Center Complex is at 11465 W. Civic Center Drive. For more information, to make a donation or to inquire about sponsorship opportunities, contact Sgt. Olivia Contreras at 623-333-7303. For more information about Special Olympics Arizona, go to specialolympicsarizona.org. which is more impressive. The cabin is nothing fancy, but materials are very solid, and workmanship is very nice. All of the controls are simple and easy to use. The fake leather trim actually looks and feels nice, so who cares if it’s not real? Driving the Passat is a real pleasure. The steering is quick enough, the handling on tight corners is brisk enough, and the ride comfortable enough. The brakes bring the vehicle to a halt with no fade. The seats are comfortable. This car would be a good choice for long trips. These expensive LED headlights do a great job of illuminating the pavement. Even past 300 feet, the spread is wide and road signs are easy to see. The only drawback is these are very expensive to replace, so don’t break them. Overall, the new Passat is an impressive sedan. The price is low and driving pleasure is high. The new extended warranty should bring peace of mind for long-term ownership as well. of reasons, but students are learning that some of the barriers are being removed,” said Maya Milhon, the lead recruiter at West-MEC. To learn more about West-MEC’s career training programs for high school and adult students, visit westmec.edu. CLEAN-AIR ENERGY FOR TODAY. BLUE SKIES FOR TOMORROW. At Palo Verde Generating Station we are committed to ensuring your family’s clean-air energy future. In fact, we provide more than two-thirds of Arizona’s clean-air energy. Proudly operated by APS, Palo Verde is dedicated to solving pressing energy issues and being a leading source for reliable power.